Symptoms of Tendonitis and Relief. Before we look at Tendonitis treatment - let’s first look at the more fundamental questions: What is Tendonitis? What are the Symptoms of Tendonitis? Tendonitis simply means an inflammation of a tendon and it is a common conditions that we, as Physiotherapists, treat on a daily basis. It mainly is caused from overuse, but can also result from an infection or a rheumatic condition. Generally, it most commonly occurs in the shoulder, elbow, knee, wrist and heel, although it can happen anywhere that tendons are found in the body. So we then label the tendonitis in relation to the particular tendon tissue that is inflamed. Achilles tendonitis- relating to an inflammation of the Achilles tendon. This is the tendon of your calf muscles. Patellar tendonitis- this is where the patellar tendon of the quadriceps muscle on the front of your thigh is inflamed. It lies below your knee cap. Adductor tendonitis- an inflammation of the adductor tendon relating to the muscle of your inner groin. This one can be very painful! The role of a tendon is to connect a muscle to a bone. As a result the causes of tendonitis are due to both bony tissues and muscle tissues activity. Both of these structures require a thorough assessment and treatment when you are complaining of tendonitis-type pain. When a tendon develops tendonitis it is a result of excess pressure on a tendon. A tendon does not have elastic properties so it cannot stretch. 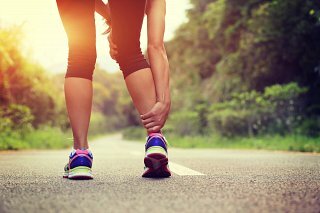 Therefore, if a muscle or a joint cause a tendon to stretch too much over a prolonged period of time, tendonitis will result. Loosening and repositioning the attaching muscles and joints will usually eliminate the underlying cause of the tendonitis. Although resolution of your pain often follows, further local treatment to the affected tendon may be required. Identifying the cause of tendonitis is a key to the long term resolution of your symptoms and tendonitis. Overuse of a tendon in a poor postural position: Commonly I treat tendonitis that result from repetitive movements of an arm or a leg which are usually, if not always, in a poor bio-mechanical position. To put this simply, repetitive movements which are frequently performed while holding a poor posture commonly result in tendonitis. The result of this repetitive movement is that the tendon which has no elastic properties is under excess stretching strain. This will eventually result in breakdown of the tendon, often in the form of inflammation and subsequent tendonitis. Excess pressure on a tendon, as a result of lifting a heavy weight with a sudden or awkward movement. This often results in tendonitis. If you suddenly or awkwardly demand a full contraction from a muscle it can result in an over-strain on the tendon attached to that muscle. If the force is severe - tendonitis may result. This form of tendonitis usually resolves quite easily with appropriate treatment as the cause of the tendonitis has been removed from the outset. Symptoms usually involve pain and weakness - with or without “crepitus”. Crepitus is an audible “creaking”, arising from the affected tendon. This creaking is audible as the muscle of the affected tendon contracts. Crepitus reminds me of a school teachers nail scratching the blackboard! If this sound is present seek immediate physiotherapy attention. Treatments are many and varied. Although treatment required will depend on the source, cause and severity of your tendonitis - I am going to share with you my treatments of choice. Firstly, the cause of your tendonitis must be removed. If your tendonitis was as a result of a heavy awkward lift or twist, the cause will already be removed, so you can embark on the active treatments towards a full resolution required. If the cause is due to poor posture, weak muscles and overuse - your treatment journey will be longer and more difficult. Postural correction requires active postural awareness and correction guided by a Chartered Physiotherapist and Pilates instructor where possible. If you have a desk job and your tendonitis arises from that, then an ergonomic assessment of your work station should be undertaken, aimed at correcting the height and position of your desk and chair at your work station. The way you move at your work may require alterations. Ultimately, my advice is to analyse all aspects both professionally and thoroughly. Secondly, treatment needs to be tailored to what stage you are at in the healing process of your tendonitis. Ice treatment is recommended in the early stages, followed by heat treatment once the acute stage has subsided. But I would say that before you use Ice and Heat treatment, seek professional advice on which stage of the healing process your tendon is currently. Manual treatments for tendonitis involve mobilisation of the affected tendon. This is a specific technique used only by a Physiotherapist and Physical Therapists. Simply massaging the affected area is not effective in my opinion. In conjunction with mobilisation, I also use taping techniques, laser therapy and strength exercises. Again, please note strength exercises performed at the wrong stage of healing may do more harm than good. So in summary, treating tendonitis effectively requires several techniques, some of which are used at certain stages of the healing process. If you have tendonitis, my advice is to seek out a local physiotherapist for advice and they will help you through the treatment process.